At Arras on the 21st, the British assembled its 5th and 50th Infantry and his 1st Army Tank Brigade (58 Mark I and only 16 powerful Mark II tanks, under General Sir Harold Franklyn. 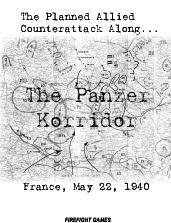 Historically, this attack, along with some French shocked the Germans. Originally, the attack was to have occurred on the 22nd, when other French units near Cambrai and their 7th Army south of Amiens were to attack. Due to confusion, the British went alone, while the Cambrai attack occurred on the 22nd and almost retook the city. The 7th Army historically was near ready but failed to attack until days later when it did not matter. The “what if” in this game is a simple one: the planned attack slated for the 22nd with the British and French at Arras, while French units near Cambrai were also part of the attack from Arras instead, and its 7th Army south of Amiens went on the coordinated offensive to cut off the panzer divisions in the 40 mile wide corridor. Paul Kantro 8 7 8 Good game - rules would have benefited from more editing.